Beginning with the 2002-03 season, the WCHA changed its schedule rotation, creating “rivals” which would play each other four times each season. St. Cloud State and North Dakota were partnered up in a scheduling system that ended in 2009-10. At that time, even though the WCHA expanded to 12 teams (adding Bemidji State and Nebraska-Omaha) and implemented a new rotating schedule, UND and SCSU continued to play four games each year. In the NCHC, that is not the case. Last season (2015-16) was the first time since 2001-02 that the two teams did not play four times in the regular season. The UND/SCSU Challenge Cup is awarded to the team that wins the regular season series. 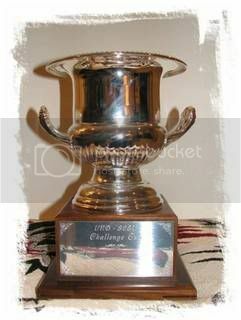 As you may be able to see in the photo above, the winning team is engraved for each year. UND won the Challenge Cup in 04-05, going 3-0-1 against the Huskies. St. Cloud took the trophy back in 05-06, sporting a record of 3-1-0 against North Dakota. In 06-07, the Sioux won two games and tied the other two, collecting six points and the Challenge Cup. The next season, the teams shared the Cup, with UND and SCSU each winning one game and tying the other two. In 08-09, North Dakota sprinted to the lead in the Challenge Cup race by winning both games in Grand Forks but needed a Saturday victory in St. Cloud to salvage a split on the weekend and reclaim the Cup. The following year (09-10), both series were splits, and the Challenge Cup was shared once again. In 2010-11, UND claimed seven of eight points (3-0-1) and took back the trophy, while the 2011-12 campaign went down as another tie. The Huskies claimed the Cup for two consecutive seasons (2012-14) by going 5-2-1 over North Dakota, but UND pulled off a Challenge Cup-worthy sweep in Grand Forks during the 2014-15 campaign that also earned them a share of the Penrose Cup. The teams split a pair of games in St. Cloud almost exactly one year ago, so the two schools shared the hardware yet again. If you’re keeping track at home, UND has won the Cup five times, St. Cloud has claimed the trophy three times, and the schools have shared the Challenge Cup four times. Since the two teams will also play in Grand Forks during the regular season this year, the teams will be earning points toward the trophy but the Challenge Cup will not be on the line this weekend at the Herb Brooks National Hockey Center. The Challenge Cup will be on display at the UND/SCSU pregame event on Saturday, November 19th at Brothers Bar & Grill (119 5th Avenue South) in St. Cloud. This is a great opportunity to meet fans on both sides of this hockey rivalry. There will be complimentary appetizers, and the event is free and open to the public. Please follow this link for a complete preview of this weekend’s games. Here’s to hockey!